April 5, 2011, 5:41 p.m.
April 4, 2011, 4:47 p.m. Yes, it’s a fact. Last week I was in Las Vegas. Why am I bragging about this on my blog? I was there for work! Lucky me. I was joined by CLS recruitment and admissions specialist, Missy Heinze, and Megan Garland Tyler, director of OU North America for Advanced Programs. The three of us were in Vegas to promote OU Las Vegas, where bachelor’s and master’s degrees are available through online courses and week-long, on-site seminars. Our on-site Advanced Programs location is at Nellis Air Force Base. One of the places we visited was the Las Vegas Metro Police Department. CLS has a special partnership with the department. Currently we are working with two chiefs, two captains and multiple sergeants and lieutenants. College degrees are necessary for promotion in the department, and we’re proud to be able to offer our programs, especially our criminal justice degrees. While we were at the department, we advised and signed up several police and corrections officers on the spot. Toward the end of our visit, we noticed that people started treating us a little differently. It wasn’t until someone put it bluntly, “You stole our coach!” that we realized why. 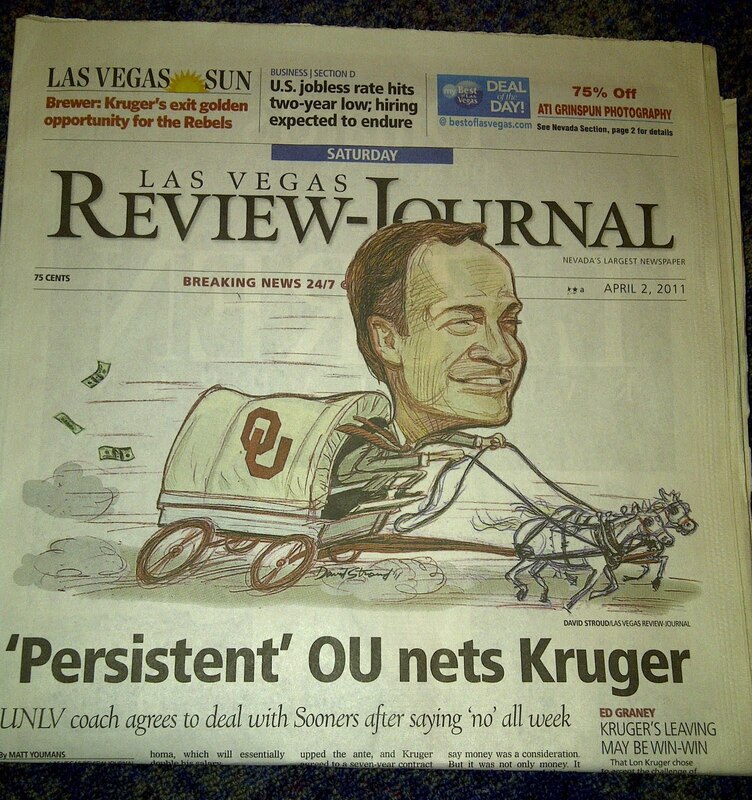 The front page of Saturday’s Las Vegas Review-Journal said it all.